This is my Ma-in-law's recipe. I think it is. At least this is how I remember she made it last time. And my Ma never makes anything with this particular stress on Cumin. So it must be the Ma-in-law's. I admit I didn't bother to verify and check again. But I always make this particular dish this way and attribute it to her. I have done it so many times that now even the husband agrees. "Yes, this is how Ma makes it", he says with every morsel of this jhaal mixed with rice. 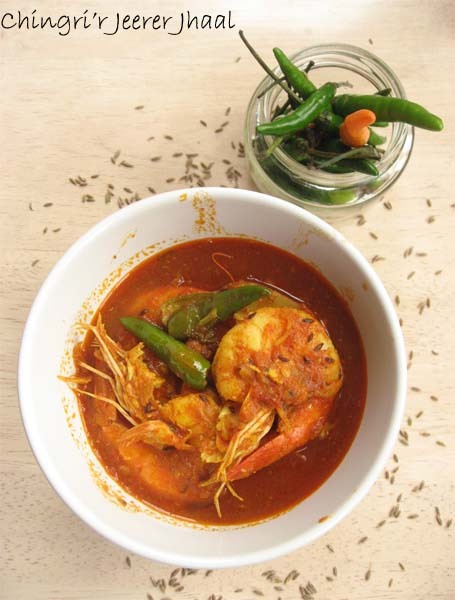 Given that we live thousands of miles apart there is no way she can do anything about it except getting branded with a Chingri'r Jeere'r Jhaal -- Shrimp in a Cumin spiced gravy. And that is not really a bad thing I must say. At least not with a dish that sends your heart a flutter singing "Dil dhak dhak karne laga". There is also a sneaky reason why I have stuck to this dish of Ma-in-law's with due diligence.It does not have onions. Has Shrimp and No Onion is a Double Plus Plus in my culinary dictionary. I love shrimp as much as I hate chopping onions. I love onions as much as I hate chopping them. If there was a religion that advocated eating onion but prohibited chopping them, I would have embraced it with tearing eyes. This dish also needs hardly anything much and the gravy is totally based on tomatoes, cumin powder and shuddh nirmal pani aka water. Good quality water is a must. As is tomatoes that are not tough like coconut. And shrimp that do not taste like cardboard. So you see it all depends on the ingredients leaving very little to your culinary skills. That suits me fine. And plus the no Onion. I think it will suit you too. 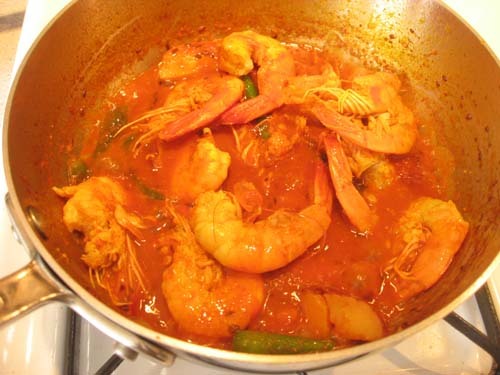 If you love shrimp and love simple meals. 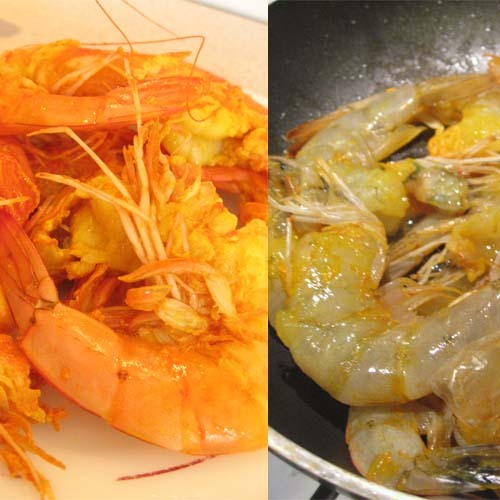 Toss shrimp with salt and turmeric powder and keep aside for 15 minutes. Heat 1/2 tbsp oil. Saute the shrimp lightly till they are no longer raw and color has changed to pale yellow. Remove and keep aside. Add 1 more tbsp oil to same pot. Saute the tomatoes for next 4-5 minutes till the raw smell is gone and it looks cooked. Add a pinch of sugar to the tomatoes. Cook until you see oil seeping out from the edges. 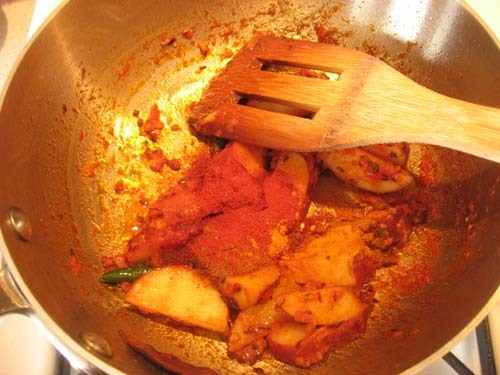 Fry the masala along with the potatoes. Now add about 1 cup of warm water. Add few more slit green chili. Mix everything and cover. Let potatoes cook. Once the potatoes are done, add the fried shrimp. Add around 1/2 cup more of water if needed. Lightly break couple of the potato slices into the gravy to give the gravy some thickness. Add 1/4th tsp of Garam Masala powder. Let the gravy simmer and come to a boil. Check all seasonings and add salt/red chili powder as necessary. In a minute switch off. This gravy is usually thin and reddish in color. 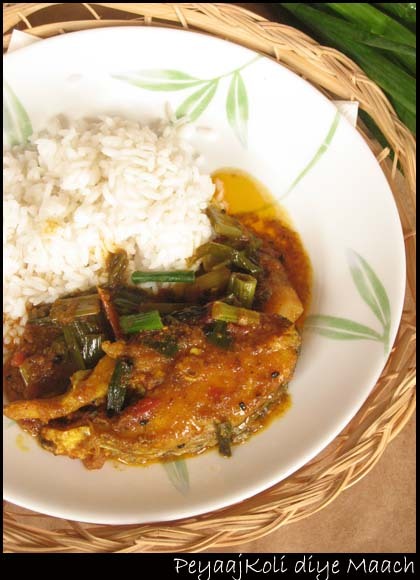 Serve hot with long-grained white rice. Th version II is a thicker gravy and involves onions and onion paste. I usually chop and fry one large onion until it is soft and translucent and then make a paste. I refrigerate this paste and use it in more than one dish. For this particular recipe, after tempering the oil with the cumin seeds, bay leaves and green chillies, add 2-3 tbsp of onion paste. Saute for couple of minutes. Now add the pureed tomato, grated ginger, pinch of sugar and a tbsp of tomato paste. 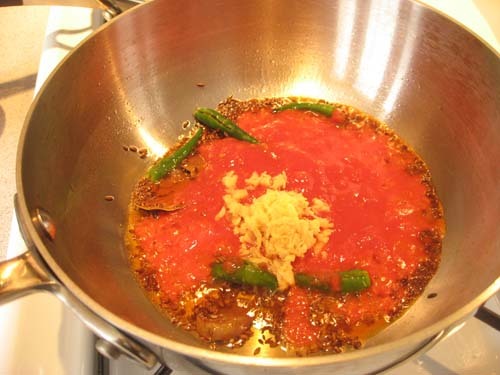 Tomato paste gives color to the gravy. Spice and Curry has also a version of Chingri Jhaal a little different from this. 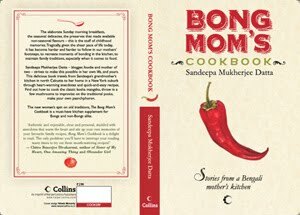 My Mother's forte is the simple unassuming everyday Bengali meal which she cooks everyday. Even if there is two vegetables, a dal, a fish curry; all in their cold corning ware whites stacked up in the refrigerator, she cooks. I shout at her asking her to stay away from the kitchen, to relax; but at the end of the day, there is always a pyrex bowl resting on the counter, still warm and smelling better than Dior. And it doesn't even contain goat cheese. Or heavy cream. Or even a hint of saffron. It is just a plain pyrex bowl with everyday Bengali food with a simple name that actually lists the vegetables in the dish instead of sounding like a bath product from the nawab's harem. Methi-Begun, Alu-Fulkopi, Bandhakopir tarakari, is how it goes instead of the glamorous Dal Maharani or Shahi Paneer or Chicken Nahanewali. Not that there is anything wrong with glamor or those names. It is just not what my Mother makes. Now since all the food is cooked by the time I reach home and I have no intention to inquire after them or photograph them in dim CFL light, I never get around to writing about them. But my friend N (who has only recently got to know about the blog and so has taken over) insisted that I have pictures of my Ma doing the cooking and thus let the people know who is in actual charge of my kitchen. "Purdah Uthao", kind of thing you know. So I said "okie-dokie" and strategically posed camera while my Mother cooked. I kept saying "Repeat, repeat" but she did not listen. 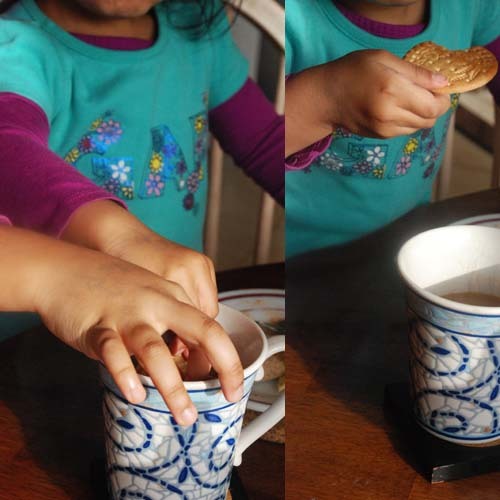 She did not even want to place hand strategically over the kadhai with a spoon or something. Ultimately there are no good shots. 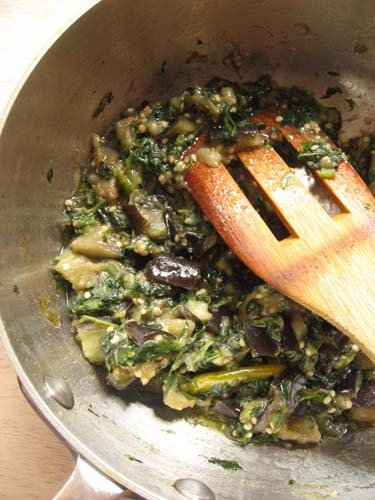 But there is a very good Methi Begun-- fenugreek greens cooked with eggplant. And my Mother made it. And that is all that matters. 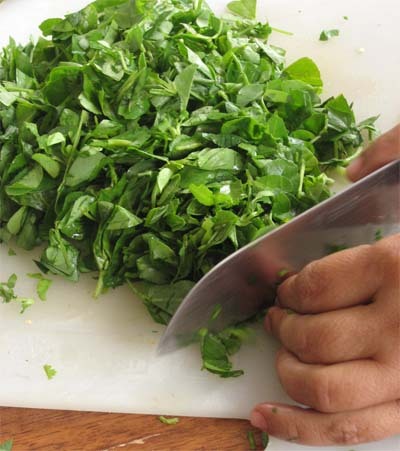 My Mother plucks Methi leaves, then chops them, saving the stems to be put into Dal. Me ? I go snip-snip with scissors. No wonder her Methi Begun tastes better. 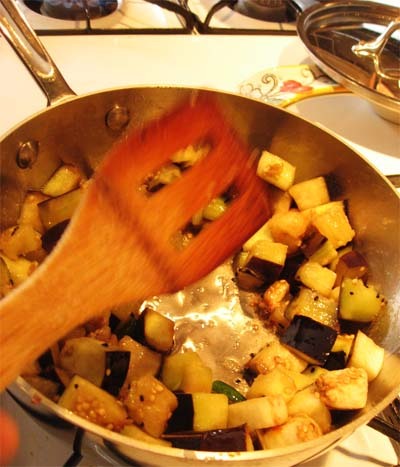 Add about 3 cups of cubed eggplants and saute till it softens. 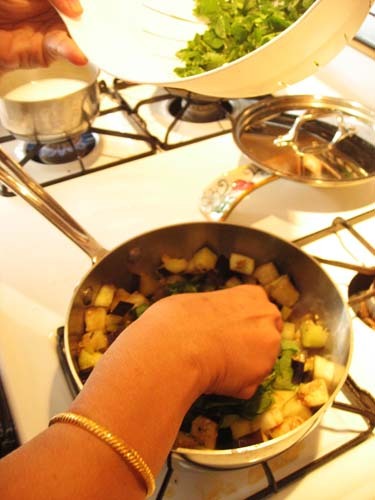 My Mother covers and lets the eggplants cook, removing the cover in between and stirring till eggplant is soft. Next is the Methi's turn. Add about 3 cups of loosely packed methi greens. Methi, Methi, fresh methi. What aroma. In between here add the salt too. 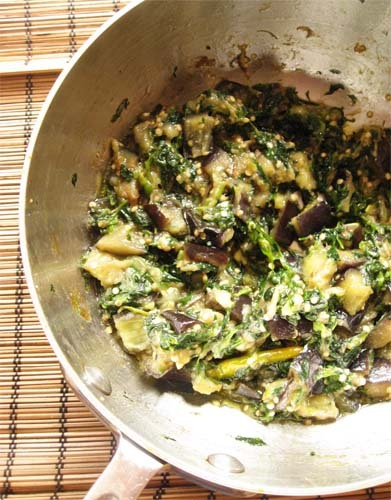 Cook till Methi greens wilt, eggplants soften and they both cuddle in harmony. 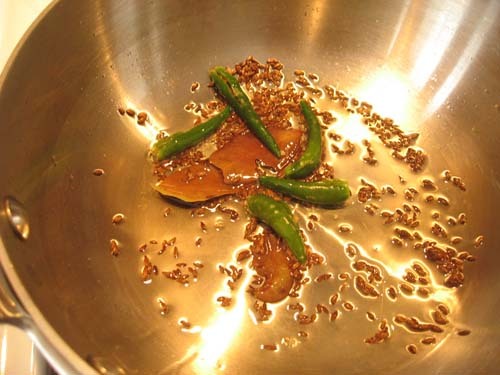 From a FB discussion there were new ideas about tempering the oil with methi seeds for a more intense flavor. I will try this next time. Raji Shanker, blogs at Peppermill Recipes. I call her Miri.Even after I knew her real name, I called her Miri. Today she is no more with us. I cannot believe it.All I have done today is thought about her. And then I decided I needed a closure. For Peace. Rest in peace, my dear friend. This post is for you and the Goshtu recipe that you mailed me will be for dinner tomorrow. 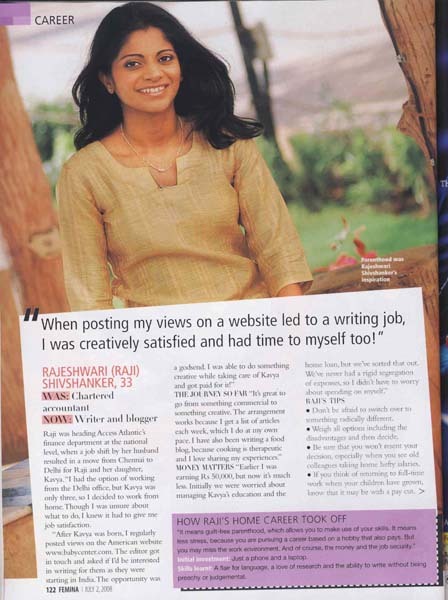 This was from a feature in Femina done on her in 2008. I think she had moved back to her financial career by now but as we all know she loved writing and excelled at it. I had connected with Miri through the world of food alone which then transcended to motherhood, career, work-life balance and even dance classes for the kids. Her Blog tag line said "Mothers, Food, Love and Career" -- four guilt groups.So true. I never met her in real life and yet I knew she was a vivacious, upbeat person always positive and full of life. Hers was one of the few blogs where I could leave a comment that went way beyond food and always looked out for her view on my posts. She rarely ever talked about her health on her blog and it was always a comforting place warmed by the colorful food.Even when she talked about her surgery (in her e-mail) she pointed out how the time off from work gave her more time to spend with her little girl and how her friends pitched in to make the summer special. I never once thought that her health issues would take her away. She touched my life in many ways and maybe I never acknowledged the way her e-mails actually cleared my thoughts.Today I owe it to you Miri. The e-mails with her discussing balancing blogging with real life had made me go back to my blog with more confidence beginning of last year. She had said in that long mail of hers "Blogging is something which stimulates me and keeps me happy. And when I'm happy then family is happy too I guess.". That she loved cooking and sharing it with people was clear from her blog. That she took the time to inspire the same joy in others is special. On a mail in which I was hyperventilating about summer vacations and the kids she had said "our children are fine and actually manage to keep themselves entertained while enjoying themselves - so don't beat yourself up about it too much - they are doing fine! :) " You see the saneness. This could only come from a Mother who would spend time cooking and baking with her little girl, doing craft activities and reading books. It loosened me up. On discussions about the work-life balance she had said "in this day and age I thought it was ridiculous that I had to "choose" between home and work - whatever happened to the work life balance philosophy spouted by all these MNCs? And how dare they ask me questions they wouldn't dare ask a man I used to think". I was secretly happy to know that right there was a fierce Mom who loved her profession and yet did not want any compromises on the home front. On the Goshtu recipe that she sent, she clearly specified "You need to fry the eggplants first (after the tempering) and cover and cook to make sure they are 3/4th cooked before adding the tamarind....since the tamarind doesn't allow it to cook...". My eggplant with tamarind did have this problem always. I never did get a chance to try it out after she told me how. My Goshtu if it gets better will be only for her. I will miss you so much Miri. You be happy and take care where you are. 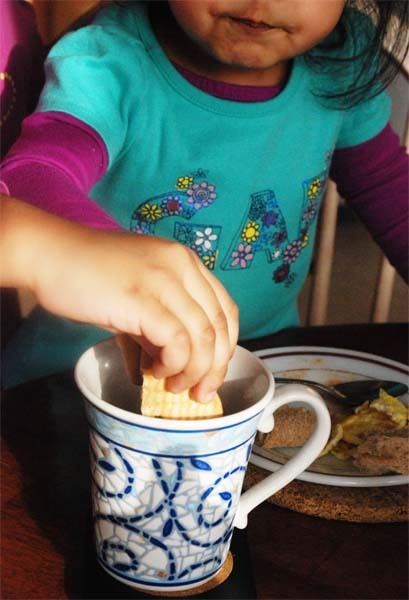 Manisha has shared a beautiful picture and words about her time with Raji. If you have been reading me for a while you know that I do not have a personal profile on FB. I have my own reasons for that. And anyway I am a late bloomer so I might get on finally when I am the last one standing. I did my eyebrows only in the late twenties so I still have a chance. I am that kind of a person. I however have a Page for my blog on FB which you can checkout by clicking on the Facebook icon on the top left column of this page. If that confuses you click here. When I started that Page I did not have a clear direction in mind. It was just one more thing which I did and then never logged in again. Recently however I do engage in a lot of discussions there. It is interesting to throw out ideas amongst like-minded people even if that means discussing one's lunch. In one of these discussions, Sunetra(whom I do not really know) said her husband made a peyaajkoli rui for her. That sounded darn interesting. The next thing you know I have bought a fresh striped bass from the Asian Market, a bunch of vibrant green peyajkoli(green onion/scallion) and am asking Sunetra (whom by the way I still do not know) how to make a peyajkoli rui. 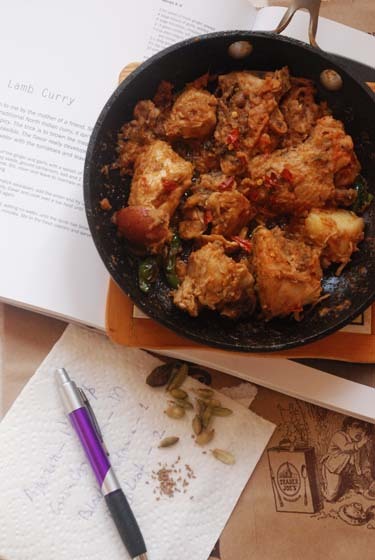 Sunetra (who btw also does not have a clue about me) very kindly writes down all the steps and shares the recipe right there on the message thread. I make it with the fresh striped bass. 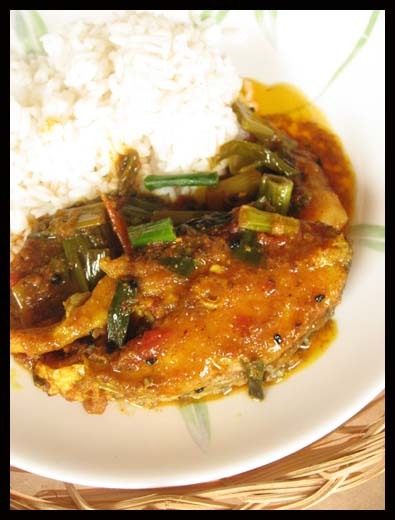 Peyajkoli Maach turned out to be really delicious.The fresh taste of the green onions mingled with the spices and fish. It is a delight. I cannot be thankful enough to her for giving us a nice lunch. It is a dish I am going to make again...and again...and again until I get tired of peyaajkoli. Thank you Sunetra, whom I still do not know and go IPO FB. 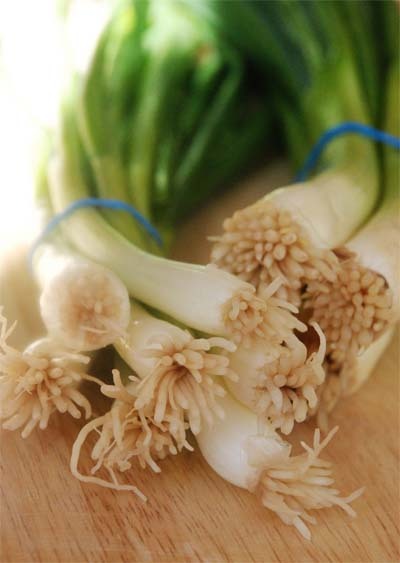 Peyajkoli or green onions (or scallion or spring onion) is a very winter thing for me. Like cauliflower and tomatoes and dhonepata it reminds me how good a warm sun can feel and how reading a book wrapped in naphthalene scented quilts is one of the many joys of life. 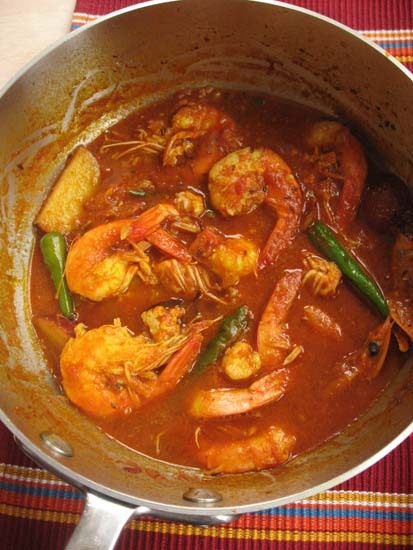 Usually with Peyajkoli I make either a vegetarian aloo-peyajkoli or a chingri diye peyajkoli like my Mother did. So this recipe with fish was definitely a new and loved dish. I did a couple of new things while cooking fish this time which I also think might help you. I broiled the fish.Usually for a Bengali style gravy I fry the fish. Taking a friend's suggestion I broiled it in my toaster oven. It turned out perfect and with 90% less oil. Win-Win. Second my onion paste sometimes tends to get bitter. So I boiled the onions and then made a paste. No bitterness and the paste could be stored for a week. If you are not a fish eating glutton but still want to make this dish, skip the fish, up the potatoes, add in some cauliflower and taste the vegetables in season. Sunetra says you can also do it with eggs. If you eat fish then of course you have no reasons to dither. Striped Bass (or any other sweet water fish) - 4 steak size pieces cleaned and scale removed. Rub fish with turmeric and salt. Keep aside for 20-30 mins. Then fry in hot mustard oil. I usually shallow fry the fish and at times even broil them in the oven at 400F (toaster oven settings). The latter really works well even for rui etc. For shallow frying about 3-4 tbsp oil is required while for broiling in the oven just 1-2 tsp is good. Chop two bunches of green onion in 1" pieces. Chop a medium sized potato in long thick slices. Make onion paste. Sometimes my onion paste made in the grinder gets bitter so I boil and then make a paste of the onions. This also stays well for a week in the refrigerator. If you have oil remaining after frying fish, use the same else heat some more. and 4 green chili slit at top. 4 tbsp of onion paste followed with 1/4tsp of sugar. Fry the onion paste till it starts browning and there is no raw smell. Add about 1 tsp of ginger paste. Fry for a minute. Next add a tomato finely chopped. 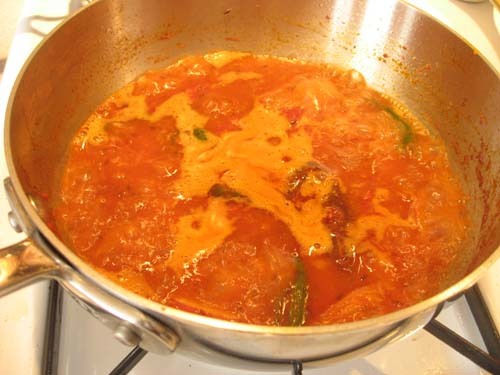 Fry the tomato till the tomato becomes all mush and oil starts separating from the masala. 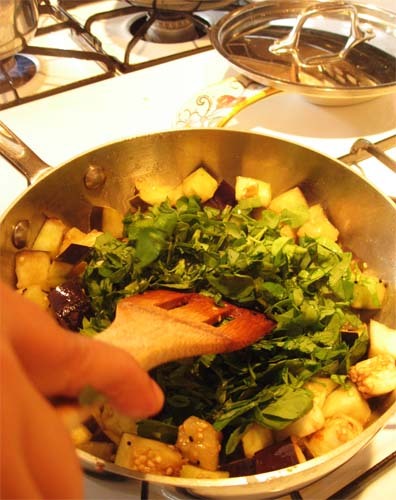 Add three quarters of the chopped green onion and potato slices. Fry till the green onion starts wilting. 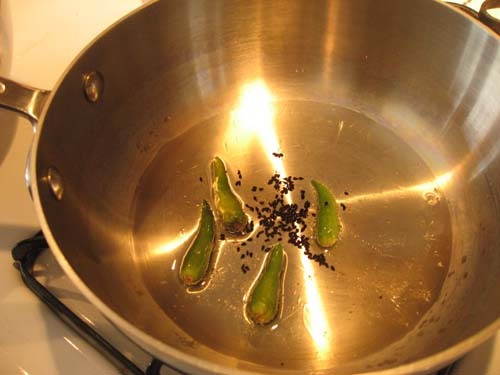 Sprinkle a little water and fry the masala for few minutes along with the green onion and potato. Now add about 3/4 cup of warm water, salt to taste and let the gravy simmer and come to a boil. Once the potatoes are cooked and you have tasted and adjusted the spices slide in the fried fish pieces. Add the rest of the chopped green onion. Let it cook in the gravy for few more minutes. Switch off. Keep covered and serve warm with white rice. I often complain about how I want to drink my tea in peace. In fact I complain so much that if BigSis makes a card for me listing a few things that I love-- right there at # 1 is "Mommy loves to Sleep" and # 2 is "Mommy wants to drink tea in peace". She has REALLY given me a card and two like that. I don't know if she is trying to get a message across---child psychologists would know better--- but that is the impression even you will get if you stayed 24x7 with me for at least a fortnight. For days fewer than that I strive hard to make an impression. But in reality I think the day I have my tea to myself I will not know what to do with it. 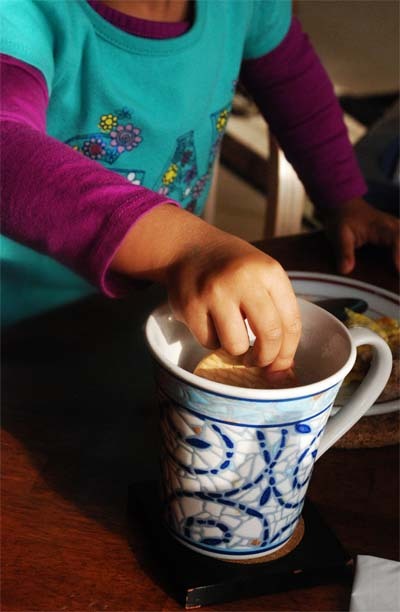 A cup of tea with two little hands dunking Marie in it is "Mera wala Chai" and I want it to remain that way. Sniff.Sniff. When I was younger, nubile(not), nymph like(not) I adored guys who wrote mushy love letters and chose white befuddled pigeons as their choice of courier. Mailman were passe. In between they would have saved the world, brought justice, developed six packs and delivered hot kisses. Compared to the latter, the former looks like cake walk. When I was younger, nubile(not), nymph like(not) I never thought of ajwain as anything but an after meal digestive which soothes a tummy that has had too many kochuri or alur chop or phuchka as the case maybe.We called ajwain -- "Joan"-- not "Joanne" mind you.We bought sachets of spicy and dusty "joan" on local trains in anticipation of a heavy meal. We drank Joaner Arok (also known as Aqua Ptychotis) in gulps after every wedding reception and talked of it with as much reverence as reserved for Joan of Arc. Ajwain or "joan" was then intermingled with our life---only in a different way. Now I use ajwain for making a chicken.It was an accident, a stupid one, the ajwain. I used it to temper the hot oil in which the chicken will be cooked. I nodded at the sharp, strong taste that a teeny spoon of that seed can bring. I won't say I am in love yet. But it is a different beginning for sure. Now let me tell you about the stupidity. 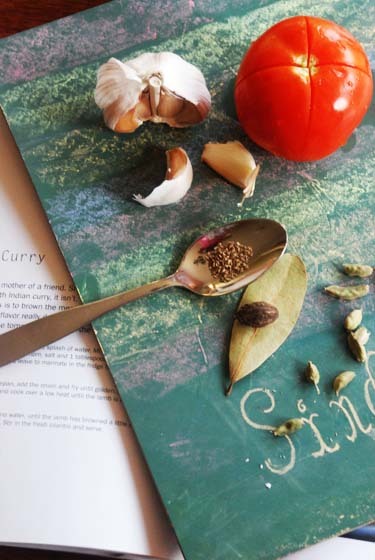 I adapted this recipe from Anjum Anand's "Sindhi Lamb Curry" which uses Caraway seeds aka Sha jeera. In a rush I read it as Carom seeds aka Ajwain. I hesitated a moment wondering whether I should go ahead but then I took heart from the delicious looking kadhai jhinga cooked with ajwain and went ahead.I spiked up the hotness, used chicken and just called it ajwain wali chicken. 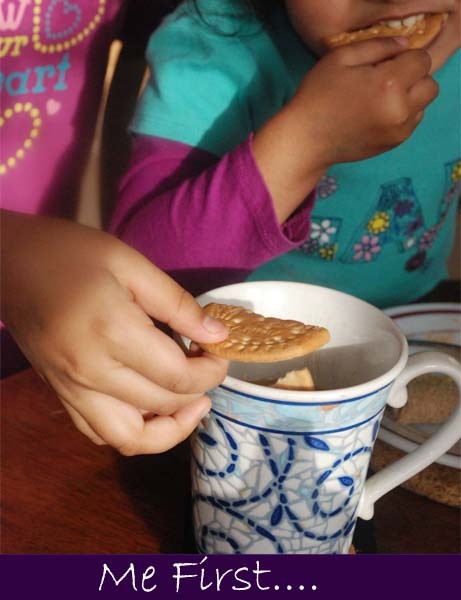 By the time I realized that the recipe had neve ever asked for Ajwain, the deed had been done and a new recipe born. For the original recipe replace the Ajwain with Sha Jeera. and 5 green cardamom lightly crushed. Now add about 2 cup of sliced onion and fry till onion is golden. Next add 2 tomatoes finely chopped. Add about 1 tsp of Red Chili powder. Add little salt. Cook till tomatoes are all mushed up and oil starts separating from the masala. Next add the chicken along with the marinade. Fry the chicken for at least 20 minutes at low-medium heat till you see the chicken has lost its raw color and has started browning. Now sprinkle a little water, add salt to taste and cover and let chicken cook. Remove cover and stir in between. Do not add any more water. Once the chicken is cooked, remove cover and continue frying the chicken till the masala releases oil on the surface. Add fresh cilantro, a squeeze of lime juice and serve.